521-PPU-ECO-DST is rated 4.5 out of 5 by 17. Rated 5 out of 5 by Tom terrific from Easy to install Replaced a automatic faucet we had about 15 years and died and I glad I did.. Rated 4 out of 5 by Starlifter from Nice faucet I installed two of these bathroom faucets several years ago. After a year, one got hard to turn. I called Delta and the repair parts were sent within a few days. Problem fixed. Nice faucet and great customer service. Rated 3 out of 5 by lzavertnik from Nice faucet, but noisy I bought 3 of these faucets and all three are noisy. I turn the water on and I can hear a loud rushing of water in the next room. Why? Rated 3 out of 5 by Sparkyboy from Looks Great, Easy to Install, but... Replaced two faucets in my master bath with this model. I love the looks and the faucets were extremely easy to install, but I have two issues that keep me from rating the faucets higher. The first issue is that the "range" of the faucet handle is not very large making it very difficult to finely adjust the hot/cold mixture ratio. My previous faucets were much easier to adjust properly. The second issue is that the way the faucets are made, the underside portion near the outlet (where the water actually comes out of the faucet) has sharp edges on each side which could potentially result in someone cutting themselves. I have accidentally brushed my hands against these edges while pulling my hands away from the faucet and it can be painful. Rated 5 out of 5 by hemfutuff from Easy to Install So you think you can’t do plumbing. Well, I think you can. With the clear instructions that accompany this faucet, you should have no trouble. The illustrations along with the written text will guide you step by step. The pop-up drains are a little tricky, as are all pop-up drains. Tighten the nut on the lift lever too tight and you can’t raise or lower the drain stopper. Loosen the nut too much and you have a leak. It takes some patience to get it just right. The faucet looks great, I like it so much better than my old two-handled faucet. Simple, nice clean lines. There is good clearance around the base of the faucet which aids in cleaning. Like I say, you should be able to install this faucet. I installed two of them, and I’m a 73-year-old female! With Delta’s reputation for quality and their lifetime warranty, I think my plumbing days are done. 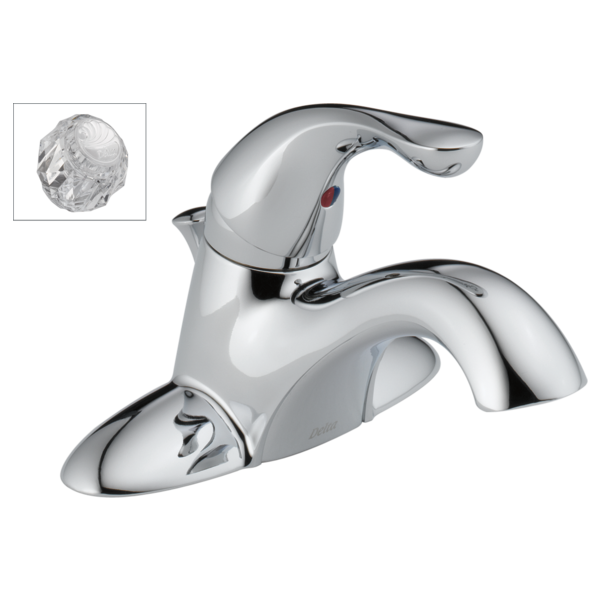 Rated 5 out of 5 by GOBILLS from Lav faucets faucets work great. love the lifetime warranty. all parts received in the box. Rated 5 out of 5 by BilltheElder from Well built, good price, stylish appearance. We needed to replace a faucet and we found this one. It looks good, has a great warranty, and was very easy to install. I have almost zero skills at anything to do with plumbing and I had an easy time with the installation. I am very happy with the purchase. What is difference between 521 eco dst and 521 ppu eco dst? The installation instructions call out silicone. Is this silicone grease or silicone RTV? Is the Aerator a charcoal filter as well?